Four score and seven years ago our fathers brought forth on this continent, a new nation, conceived in liberty and dedicated to the proposition that all men are created equal. Now we are engaged in a great civil war, testing whether that nation or any nation so conceived and so dedicated can long endure. We are met on a great battlefield of that war. We have come to dedicate a portion of that field, as a final resting-place for those who here gave their lives that that nation might live. It is altogether fitting and proper that we should do this. But, in a larger sense, we can not dedicate, we can not consecrate, we can not hallow this ground. The brave men, living and dead, who struggled here have consecrated it, far above our poor power to add or detract. The world will little note nor long remember what we say here, but it can never forget what they did here. It is for us the living, rather, to be dedicated here to the unfinished work which they who fought here have thus far so nobly advanced. It is rather for us to be here dedicated to the great task remaining before us -- that from these honored dead we take increased devotion to that cause for which they gave the last full measure of devotion -- that we here highly resolve that these dead shall not have died in vain -- that this nation, under God, shall have a new birth of freedom -- and that government of the people, by the people, for the people, shall not perish from the earth. Lincoln delivered his two-minute Gettysburg Address on November 19, 1863, at the dedication of the cemetery at Gettysburg, the site of the battle that arguable turned the tide of the Civil War in favor of the Union. So short was his message that many in the crowd did not even realize he was speaking until he was done. But so powerful were the words that shone a new light on the Declaration of Independence, a document espousing equality for all people. 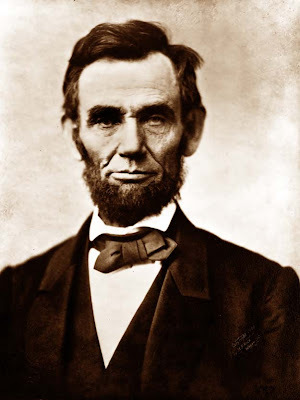 Just ten months before, on January 1, 1863, Lincoln's Emancipation Proclamation had declared freedom for the slaves. And whereas the Declaration of Independence put forth freedom for all as an idea, the Gettysburg Address was a bold step toward making a "new birth of freedom" for all, indlucing the slaves, a reality. The last written draft of the Gettysburg Address contained 265 words. However, as Lincoln stood to deliver the address, he added two words on the spur of the moment: under God. Lincoln's eloquent address is considered one of the finest speeches ever delivered by an American, and the addition of just two words reminds us of a truth that we must not subtract from America's equation: Our future will be assured and secured only as we remain under God, in His grace and guidance. 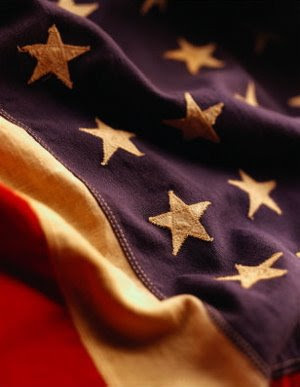 The Pledge of Allegiance was formed largely from the vision of three men: Daniel Ford, James Upham, and Fracis Bellamy. Daniel Ford was the publisher of a popular family magazine, The Youth's Companion. Ford's belief in Christ was a great influence on the content of his magazine, and he guided his life and business by Christain principles. With a circulation of nearly half a million, The Youth's Companion was the nation's most-read weekly magazine in the late 1880s and early 1890s. James Upham, head of the magazine's premium department, was disappointed that most public schools did not have their own flags, so he launched a campaign wherein schoolchildren raised funds to purchase a flag from the magazine. As a result, about thirty thousand flags were sold and flown for the first time in front of America's schools between 1888 and 1891. In 1892, the country prepared to celebrate the four hundredth anniversary of Columbus's arrival in America. President Benjamin Harrison delcared Columbus Day, October 12, a national holiday for the first time. Upham wanted children across the country to participate, so he began planning the National Public School Celebration that would center on raising a school flag. First, a proclamation from the president would be read, followed by prayer and Scripture reading, the singing of "America," and patriotic speeches. Wanting the children to participate more fully, Upham determined that they should recite a salute to the flag. He enlisted the talents of another magazine employee, Francis Bellamy, who had been pastor at the Boston church Daniel Ford attended. Bellamy labored for weeks and finally brought his composition to Upham: I pledge allegiance to my Flag and to the Republic for which it stands: one Nation, indivisible, with liberty and justice for all. It was published in The Youth's Companion on September 8, 1892. Thirty-four days later, twelve million schoolchildren across the country recited the Pledge of Allegiance for the first time. In 1923 and 1924 the words my Flag were changed to the Flag of the United States of America. In 1948, a man named Louis A. Bowman proposed to his fellow Sons of the American Revolution that the words under God be added after one nation -- following a precedent set by Abraham Lincoln, who had extemporaneously added those same words to the end of his Gettysburg Address. Then, in 1952, William Randolph Hearst caught wind of the idea and began a campaign in his newspapers that helped bring about legislation to officially add under God to the Pledge. President Dwight D. Eisenhower approved this change on Flag Day, 1954, and proclaimed, "In this way we are reaffirming the transcendence of religious faith in America's heritage and future; in this way we shall constantly strengthen those spiritual weapons which forever will be our country's most powerful resource in peace and war." May you remember this President's Day the foundations of our nation, and pray for our return to truth, our return to indivisible. One nation, under God.